A new study led by a team of University of Florida researchers has revealed a dramatic impact on the identification and treatment of depression in children and teenagers as a result of a specialized primary care provider training intervention. 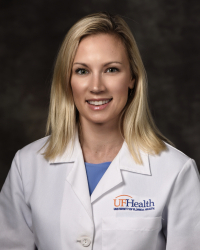 Elise Fallucco, M.D., an associate professor of psychiatry at the UF College of Medicine – Jacksonville who specializes in child and adolescent psychiatry, developed the primary care provider care, or PCP, training intervention in response to reports that PCPs were not getting adequate training in depression care. The objective of the study was to examine the long-term impact of primary care training and its potential impact on patient care. The research, titled “Impact of Experimental Training with Standardized Patients on Screening and Diagnosis of Adolescent Depression in Primary Care,” was published in the Journal of Adolescent Health. Fallucco and her research team — Lauren James, M.A., and Carmen Smotherman, M.S., both from the UF College of Medicine – Jacksonville; and Peggy Greco, Ph.D., from Nemours Children’s Healthcare in Jacksonville — determined that training primary care providers led to a nearly 20 percent increase in the number of adolescents who were screened for depression. The research team believes the study is one of the very few to demonstrate a significant, immediate and pervasive impact on clinical care of adolescent depression. Statistics show that adolescents were more than 40 times more likely to be screened by their primary care provider, and almost three times more likely to be diagnosed with depression, after their PCP participated in training.